Our three School-Based Health Centers (SBHC) located at Waianae High, Waianae Intermediate, and Nanakuli High & Intermediate Schools make it convenient for students to receive primary care and behavioral health services right at their school! Our SBHC Team is dedicated to keeping our students healthy, returning them to class and focused on their studies. We offer a full range of health care services from sick visits to sports physicals. More information including hours, location and phone number are available HERE. Summer 2018 hours are available HERE. We look forward to assisting our westside youth strive both academically and physically. For the period August 1, 2016 to August 26, 2017, healthcare providers at the two SBHCs treated 2,292 students for everything from coughs and abrasions to headaches and ankle injuries. Of these students, 2,121 (93%) were able to return to class immediately after treatment. The SBHCs each have an official name and logo thanks to the creative efforts of students who were invited to submit a logo drawing and clinic name in a contest sponsored by the Waianae Coast Comprehensive Health Center. Finalists were selected by a special committee comprised of representatives from school administration, staff and students. Students from each school then voted for their favorite finalist. Winners received recognition and artistic credit along with a $50 cash prize and four movie tickets. Mahalo to all the students who submitted their creative entries and congratulations to the winners for their entries receiving the most votes in what was a very close contest. Roque-Souza, who was inspired by the Rod of Asclepius, a common symbol associated with healing and medicine of a snake wrapped around a rod. 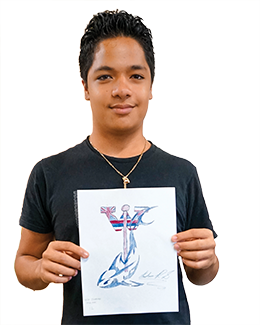 Josh added his own creative twist by changing the snake to a shark and adding a bold "W" with a Hawaiian flag component—the same colors as WHS. The clinic's new name, Hale Ola Kino Maika'i means "House of Good Health". Josh's love for art is as great as his talent and he is considering attending art school after he graduates. 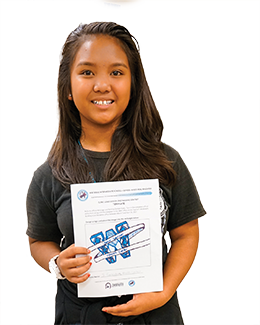 The WIS winner was Chasity Corpuz-Butihi who will begin 9th grade in August. Her teal and white logo design featured a "W" wrapped in a ribbon with her proposed clinic name, "Junior Searider Health Center" emblazoned across it. Chasity included some creative primitive symbols as a graphic element. Although Chasity was not sure if she would make art her profession, she recently began her first summer in Punahou School's Pueo program to help her prepare for college. The Waianae Intermediate School-Based Health Center held a blessing and open house on July 28, 2016. Mahalo to all the parents and children who stopped by to check out the beautiful clinic! KITV NEWS 4 aired the following story at 10PM that evening and again at 5:30 AM Friday.